By subscribing to your favorite artists’ channels, you’ll get their latest videos delivered straight to your YouTube homepage. It’s a quick and easy way for you to stay up-to-date on their music videos and behind-the-scenes news. On the MyYouTube Channel, you can flip through all the participating artist profiles, watch their exclusive videos, and even find out what YouTube channels they, themselves, like to watch. And did we mention all the prizes? Every artist is giving out five prizes to users who score points for them in the contest. That’s over 250 prizes, ranging from t-shirts and CD’s to fully-loaded ipod shuffles and concert tickets. You can view the points you have scored for an artist, as well as that artist’s total points to date, next to the artist’s thumbnail on the left side of the page. These artists can’t win without your help, so head on over to youtube.com/myyoutube and start subscribing now! Are you Rihanna’s biggest fan? Do you just love Justin Bieber? Well now’s your chance to show these artists just how devoted you really are. 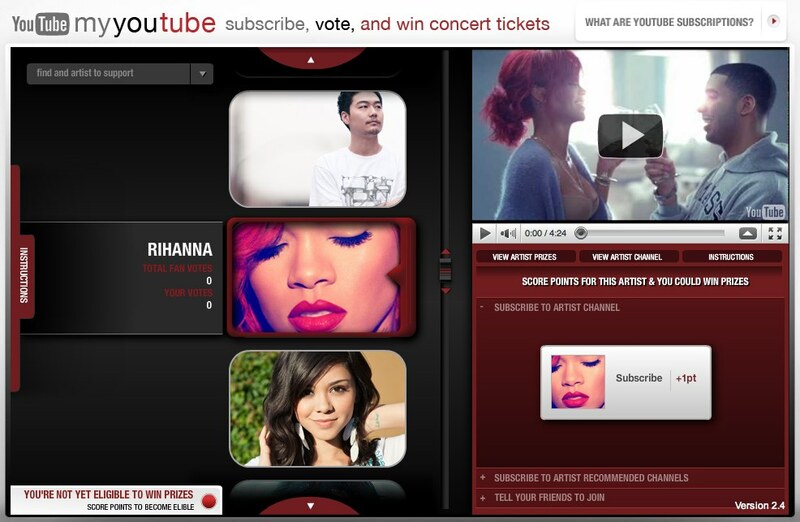 The MyYouTube contest launches today and the participating music artists need your help to win. Over the next two months, the music artists will compete to score the most points on the MyYouTube Channel. But they only score points when YOU subscribe to their channels and share with your friends. Really great idea! Love so many of the artists participating! Why not allow all artist, known and unknown, to compete side by side via YouTubers casting their votes? Anyone?